Phil Karl completed the traditional Tibetan Buddhist three-year meditation retreat, which confers the title of Lama in the Karma Kagyu tradition, at Sopa Choling Retreat Center, Gampo Abbey in 2003. He has been a student of Chogyam Trungpa since 1977. Phil has taught many university and public courses in Buddhism, guided meditation intensives for twenty-five years, and is an ordained Buddhist Minister. He has instructed at the Shambhala International Seminary, and until recently was Core Faculty Member and Education Director of the Ngedon School’s online dharma study program. Phil’s graduate study was completed at the Naropa University in Buddhist and Western Psychology in 1979, and he is presently an Adjunct Faculty member at the University. He has worked for many years as a consulting corporate trainer and coach and has recently formed a small consultancy, Insight Learning LLC. 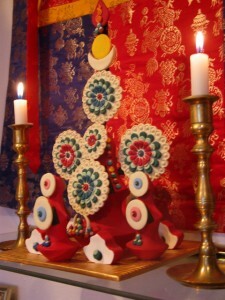 While practicing in the three-year retreat at Gampo Abbey several years ago I learned to make tormas. I’d been making tormas for a number of years, but finally got comprehensive training, and plenty of practice in that rather long retreat.